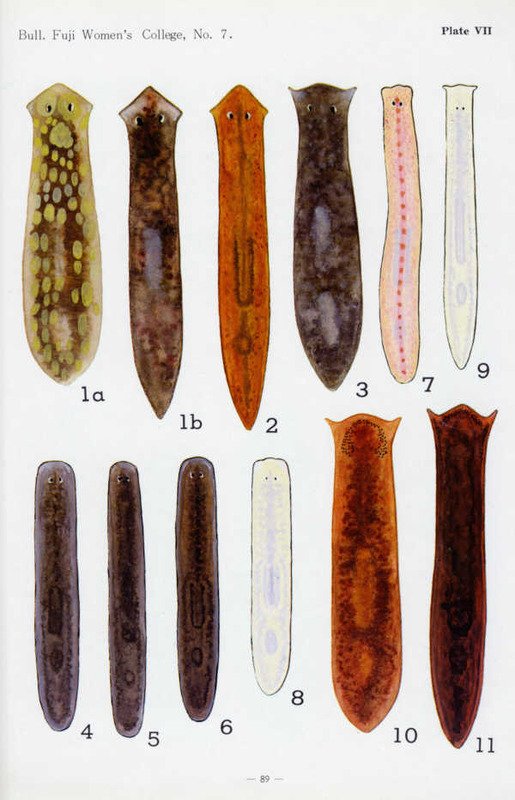 The taxonomy and distributional ecology of Japanese freshwater planarians ("Turbellaria": Seriata: Tricladida) have been studied by Dr. M. Kawakatsu and his team members for the past 50 years. In 1969, he published an illustrated list of this animal group with distribution maps and water color paintings of the 19 known species at that time (2 families and 6 genera; including 2 unidentified species of the genus Sphalloplana). After the 1970s', 5 native species and 3 exotic species have been described and reported by Kawakatsu and his coauthors from Japan. The taxonomic system from the rank of suborder through infraorder, family, subfamily, genus, and subgenus was revised in 1974. In the present web article a revised list of all the known species of Japanese freshwater planarians is given with their latest Linnean names and Japanese names (see Notes for the Taxonomic List) in the Roman alphabet (1 suborder, 2 infraorders, 4 families, 2 subfamilies, 8 genera, 1 subgenus, 27 species; including 2 undescribed species). Dr. Kawakatsu's (1969) original 2 color plates are also reproduced herein; no paintings of 8 species described after 1970 are included (see the mark "-" in the Taxonomic List). In Japan both Japanese and Linnean names of animals (and plants) are employed in usual biology books and encyclopedias. For this custom a complehensive explanation is given in the following English article. Grygier, M. J. 1993. Japanese zoological nomenclature. Amer. Assn. Zool. Nomenclature, for September 1993: 5-8. The infraorder Cavernicola Sluys, 1990 (including 1 family and 5 genera), was established in the following publication. Sluys, R. 1990. A monograph of the Dimarcusidae (Platyhelminthes, Seriata, Tricladida). Zool. Scripta, 19 (1): 13-29. ("Turbellaria": Seriata: Tricladida): mainly based on Kawakatsu, 1998. Dugesia japonica Ichikawa et Kawakatsu, 1964 Nami-uzumushi 1a, b. [R] D. izuensis Kato, 1943 Izu-uzumishi 2. Phagocata vivida (Ijima et Kaburaki, 1916) Miyama-uzumushi 3. Ph. kawakatsui Okugawa, 1956 Kogata-uzumushi 4. Ph. teshirogii Ichikawa et Kawakatsu, 1962 Toohoku-kogata-uzumushi 5. Ph. iwamai Ichikawa et Kawakatsu, 1962 Ezo-kogata-uzumushi 6. [R] Ph. papillifera (Ijima et Kaburaki, 1916) Kantoo-ido-uzumushi 7. Ph. albata Ichikawa et Kawakatsu, 1962 Sooya-ido-uzumushi 8. Ph. tenella Ichikawa et Kawakatsu, 1963 Hidaka-hoso-uzumushi 9. Polycelis (Polycelis) sapporo (Ijima et Kaburaki, 1916) Kitashiro-kazume-uzumushi 12. Seidlia auriculata (Ijima et Kaburaki, 1916) Kazume-uzumushi 10. S. schmidti (Zabusov, 1916) Kita-kazume-uzumushi 11. S. akkeshi (Ichikawa et Kawakatsu, 1963) Akkeshi-kazume-uzumushi 13. Sphalloplana sp.2 Himeji-menashi-uzumushi 15a, b.
Bdellocephala annandalei Ijima et Kaburaki, 1916 Biwa-oo-uzumushi 16. B. brunnea Ijima et Kaburaki, 1916 Izumi-oo-uzumushi 17. Dendrocoelopsis ezensis Ichikawa et Okugawa, 1958 Ezo-uzumushi 18. Den. lactea Ichikawa et Okugawa, 1958 Kitashiro-uzumushi 19. In the taxonomic list the figures of 8 species with a mark "-" are not presented in this web article. [R]: Rare species listed in Kawakatsu (1991); [ET]: Exotic species in Japan; *: A new Japanese name was given by Kawakatsu (1998); **: A new Japanese name was given in this web article in cooperation with Dr. Kawakatsu. The right-side numbers (1-19) given in the taxonomic list are correspond to the number of figures of animals in the next 2 plates (VII and VIII). Dugesia japonica: 1a. The Matsumoto stock (sexual race). 1b. The Kyûshû stock (asexual race). Sphalloplana sp. 2: 15a. The Himeji stock. 15b. Adhesive organ (an enlarged, ventral view of the head). So-called "planarians" in a narrow sense indicate macroscopic flatworms in the order Tricladida. In a wide sense, however, that word means a general, collective name of animals in a few orders (and suborders) of the class "Turbellaria". The order Polycladida is a large group of marine planarians. The following tabular list is a summary of the taxa and their numbers listed in a Japanese paper published by Kawakatsu (1998). His list includes flatworms of 8 orders, 20 families, 93 species, and 3 subspecies. According to Dr. Kawakatsu that list was prepared as basic data for the compilation of the Japanese Red Data Book of Endangered Species: The Invertebrates (First Ed., 1991; see the References in the previous section of this web article). PROLECITHOPHORA (=HOLOCOELA; =CUMULATA) 1f. 1sp. Maricola (=Retrobursalia) Marine planarians 1f. 5spp. Paludicola (=Probursalia) Freshwater planarians 3f. 27spp. Terricola Land planarians 3f. 25spp. Kawakatsu's (1998) list of "Turbellarians" includes macroscopic, freshwater and terrestrial species and only a single marine triclad, Ectoplana limuli (Ijima et Kaburaki, 1916), an ectoparasitic species of the Japanese helmet crab (Tachypleus tridentatus). This probably results from T. tridentatus approaching beaches at spring tide to lay their eggs in the sand. In this list, Rhodax? sp. in the Cavernicola is placed in the Paludicola. Additionally, the class "Turbellaria" is now considered a non-monophyletic group. Sasaki, the compiler of this web article, wishes to express his hearty thanks to Dr. Masaharu Kawakatsu (Sapporo, Japan) for his kind permission for the opening of this home page mainly based upon his papers as well as for his careful reading and suggestions in an early draft. The compiler is also indebted to Dr. Robert W. Mitchell (Bandera, Texas, U.S.A.) for his kind reading and corrections of English usage in the final draft. Kawakatsu, M. 1969. 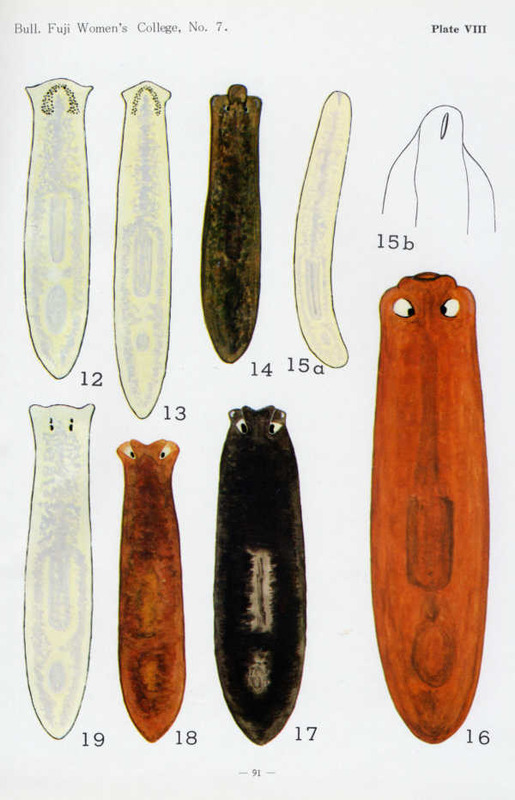 An illustrated list of Japanese freshwater planarians in color. Bull. Fuji Women's College, (7), Ser. II: 45-91 (+ pls. VII-VIII). This web article was opened in public on May 5, 2001. According to a suggestion of Dr. Kawakatsu, it becomes clear that some additions and corrections to the present article are necessary. Species list: 5 new Japanese names in the Roman alphabet were given to a single infraorder, a single family and 3 genera. Paludicola: 3f. 2sf. 8g. 27spp.